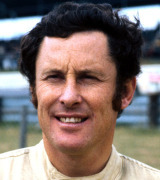 A front runner in F5000, Graham McRae only competed in one grand prix in an uncompetitive ISO Marboro fielded by Sir Frank Williams. His race didn't even last a lap as the throttle linkage failed and he was forced to retire. He now lives in New Zealand and was running a replica Porsche business until recently. He is also regularly involved in New Zealand Formula Ford and historic events.